There’s one resolution that everyone makes the day after new year’s eve. “I will never, ever drink again.” We never stick to it but we sure as hell mean it at the time. After one hell of a party last night, you’ve woken up with your head pounding like a bongo drum, mouth dry as the Sahara. Beside you, an ocean of confetti, plastic shot cups and empty bottles of Jägermeister. Desperate for a glass of water you stumble through the house like a zombie in the walking dead, that is if you’ve even got the energy to get up at all! 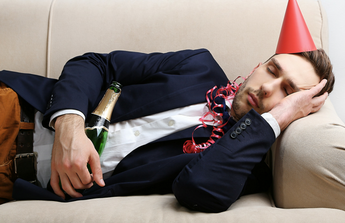 There’s a reason January 1st is known as National Hangover Day. We’ve all been there and we feel your pain, so we’ve come up with a list of the most effective hangover cures we’ve been able to find to help you survive the morning after the insanity of the night before. Part 1: Drink a LOT of water! The first and most basic combatant against the hangover from hell. You don’t need me to tell you how dehydrated a heavy night of drinking can make you feel. It’s actually a good idea to drink some water before you go to sleep the night before, as this can somewhat lessen the blow the following morning. Part 2: No seriously, drink a LOT of water! Some over the counter painkillers, such as paracetamol, ibuprofen and so on, may help you to feel slightly less horrendous than before. Beware when taking Aspirin. It may help with the headache but can potentially irritate the stomach and cause feelings of sickness. God knows that’s the last thing you need. I'm talking full on fry ups, any left overs from last nights dinner, hell, have a pizza if you want to. As well as fighting a hangover post-new year, there’s also some pre-emptive measures you can take too lessen the effects the following morning. First off all, don’t drink on an empty stomach. Eat well, ideally with a meal containing plenty of carbs or fats, like pasta or rice. Secondly, drink lots of water in between alcoholic drinks. Avoid fizzy drinks as they speed up the absorption of alcohol into your system. Keep in mind that these aren’t cures. In this cruel, cruel world there’s no such thing as a hangover cure, but they might at least ease the after effects of last night’s antics.